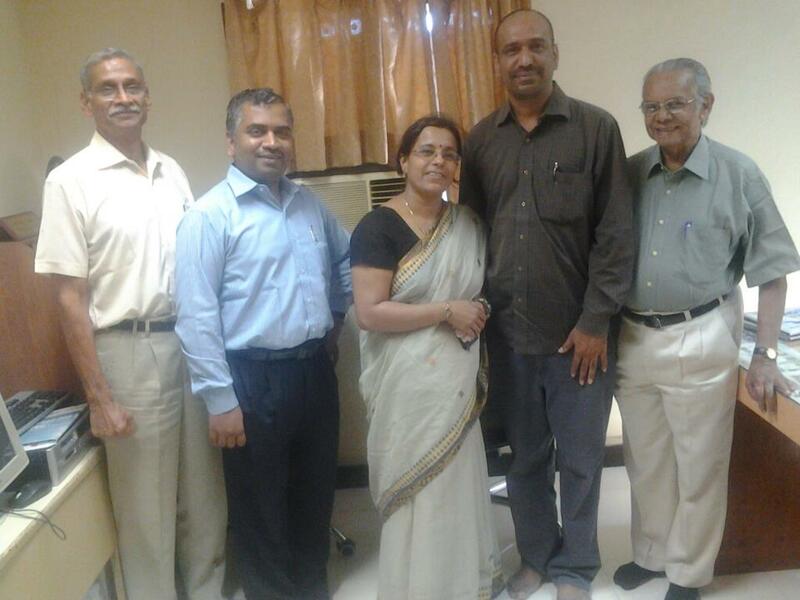 IDF Goodness Ambassadors Jayakumar Nair and Geetha Jayakumar Nair visited IDF office and congratulated on the excellent initiative of IDF Centre of Excellence. 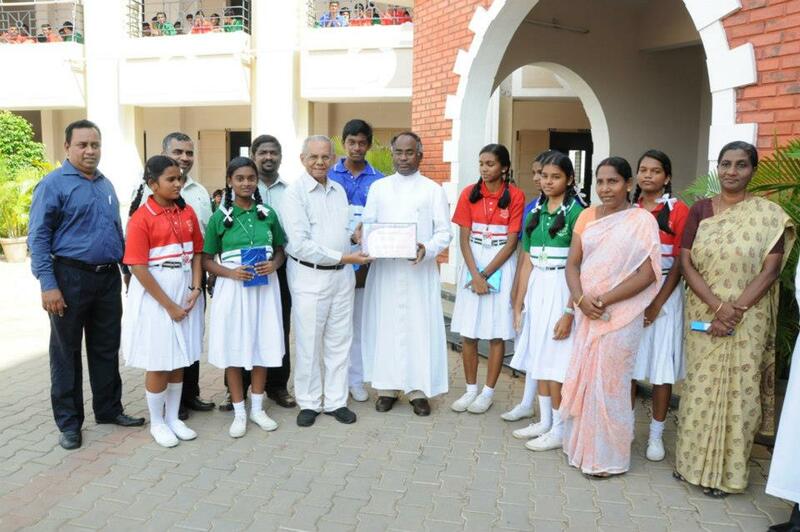 Dr.Pillai, Capt.Bala and Dr.Narayan conveyed special thanks to the goodness ambasadors for their kind and continued support. Greetings and good wishes from IDF ! Hope you all are doing fine. We wish you and everyone in the family a happy time. First of all let me express our sincere thanks to you for supporting blanket mobilising drive for couple of years now. Blankets are required for the poor leprosy patients and those needy persons in leprosy colonies in northern parts of India and needy and elderly people living in hilly regions in the south and western parts of India. Our thanks to you for all your goodness. The current situation The winter has already set in some parts of northern region and hilly regions of India. As the days go by, the climate will get colder and colder. It will become very difficult for people, particular the those have-nots living in leprosy colonies and older people to bear the biting cold. It is always better to offer them blankets before hand so that they are protected. We are confident that this year too we will receive good response from our friends. The more the support received by IDF, the more will be the beneficiaries and more will be blessings received by you and family. Last year we could mobilise a good number of blankets for poor leprosy patients and underprivileged children under the care of IDF projects. Our request We have started receiving requests for blankets from different projects in northern India/ hilly regions in India. It is the time to show your love and warmth to the have-nots in the society. Let's do it now before it is too late. We need atleast 3000 blankets for this winter. We would request people to come forward and donate blankets or cash for blankets. Donations may be sent to Indian Development Foundation (L 10/ 3 & 4 Jal Ratan Deep, Bangur Nagar, Goregan (W), Mumbai 400 104 - idfindia@gmail.com OR idfark@gmail.com). We will send a complete report of distribution. Cost per blanket is quoted as Rs.300/= per blanket. The donation amount may be sent by way of cheque/ DD in favour of Indian Development Foundation. Donations to IDF are exempted under sec 80G of IT Act. As and when we receive the donation for blankets the same will be sent to project areas so that there is no wastage of time in transportation. The blankets are purchased locally and distributed. IDF's Savings Bank A/c. 207001000083586 - IFSC - IOBA0002070 - Indian Overseas Bank, Goregaon (W), Mumbai 400104 (Send mail and confirm - Specify For Blankets) Why postpone goodness in life ? What is possible today may not be possible later. 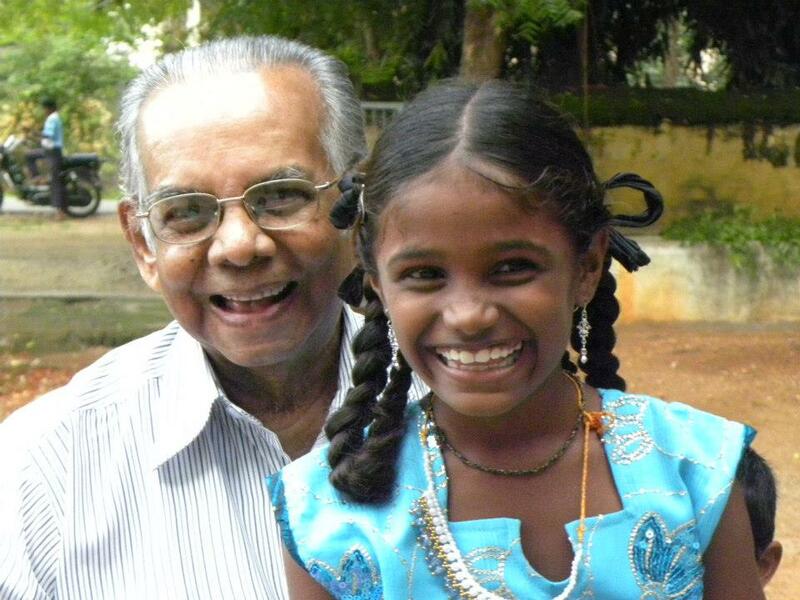 Please give your love filled with warmth to the leprosy affected people and other underprivileged children. Looking forward to your kind and continued support and with regards, Dr. Narayan Iyer - 9819131388 - 21-11-2012 PS : You can also forward this appeal to all your friends and contacts so that the message spreads in the quest of goodness. Let noble thoughts come to us from everyside. 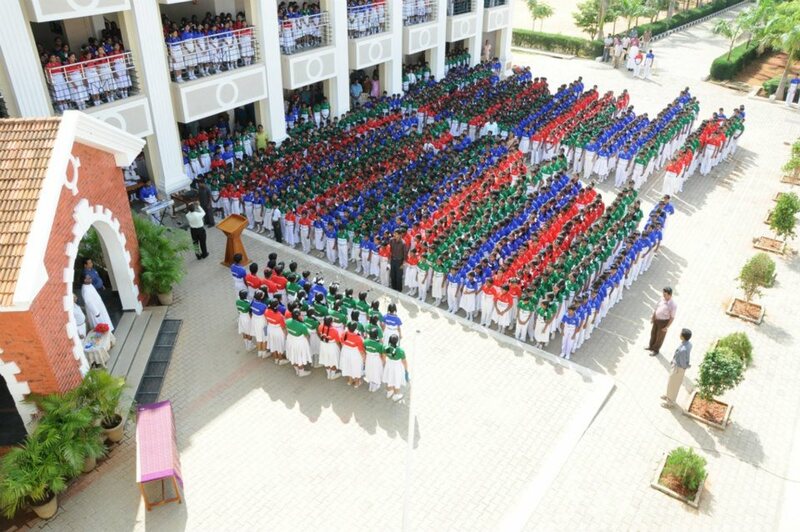 PSBB Millennium School at OMR, Chennai invited the students of Thiruvalluvar Bal Gurukul, Velacherry, Chennai as part of their COLORS DAY event. PSBB team gave a royal welcome to the Bal Gurukul children. 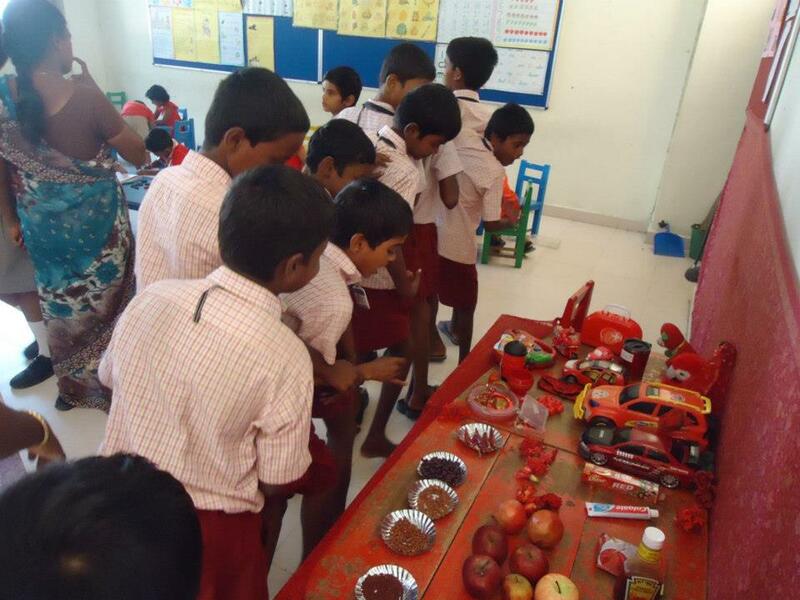 They were taken to different classrooms and were given exposure to colorful scientific models. 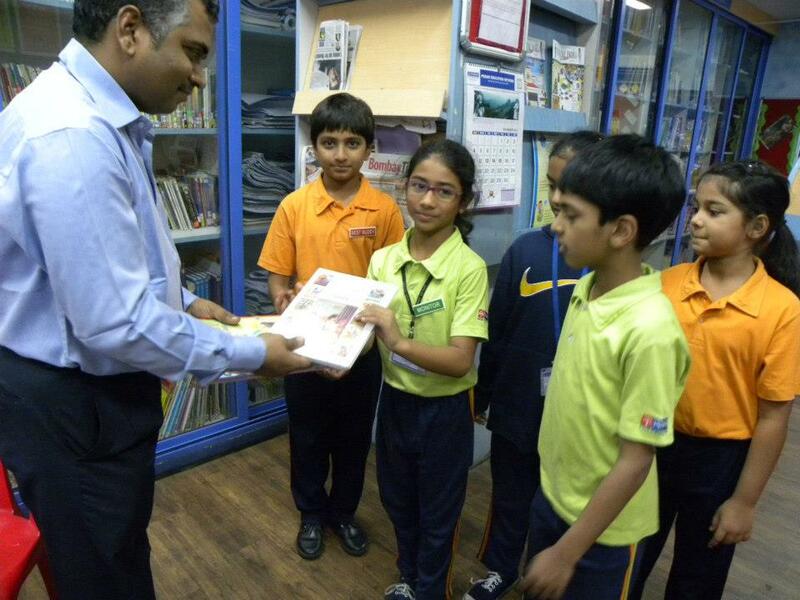 TBG children felt extremely happy to receive warmth and compassion from the PSBB team. 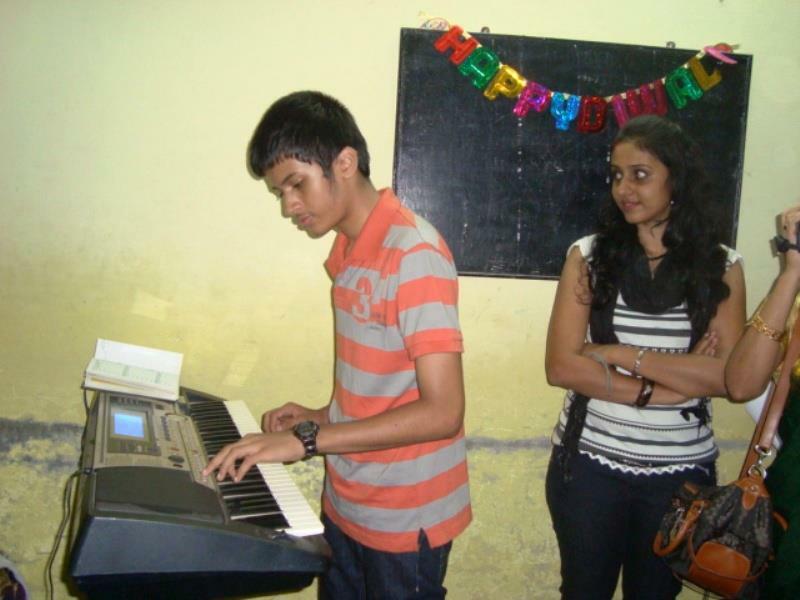 Food, gifts and fun really created a greater impact on TBG students. The visiting students expressed sincere thanks to PSBB team - Mrs. Hema Nagarajan (Principal), Mrs. Janani Iyer, Mrs. Rukmani Motilal and the students - for bringing happiness in their lives. 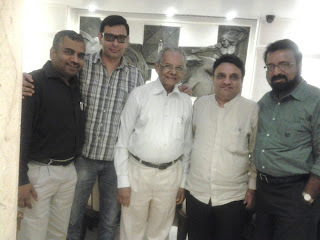 Mr. Sreeram and Mr. Sathyamurthy from IDF co-odinated the iDiscover event (20-11-2012). IDF team led by Dr. ARK. Pillai, Dr. H. Sudarshan, Wg. Cdr. 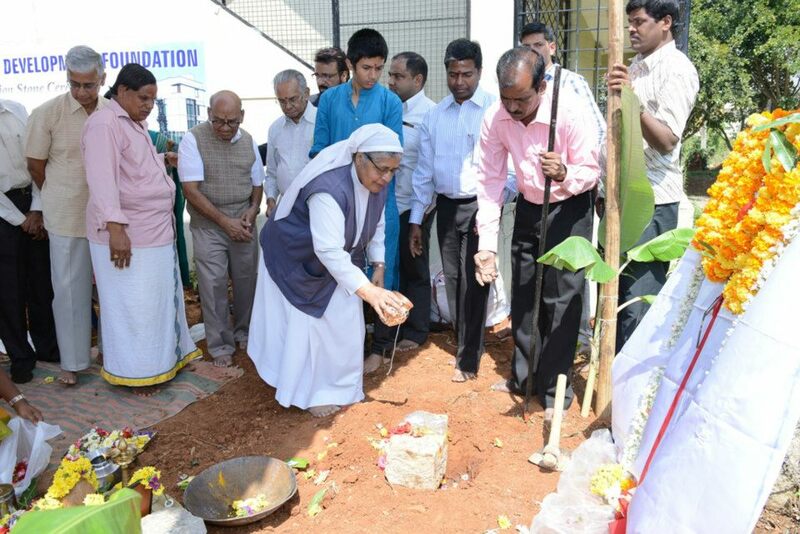 S. Balasubramanian VrC and Mr. J.R. Dhanaseelan laid the foundation stone for the CoE, the much awaited project for a holistic sustainable development programme. 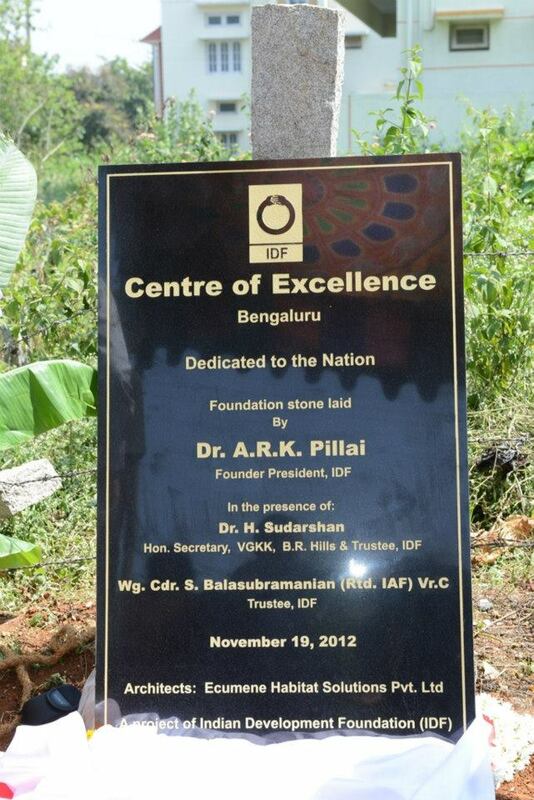 Students from nursing college, IDF Bal Gurukuls, IDF Social Ambassadors and Architects Ecumene team joined IDF Board of Trustees in laying the foundation stone for IDF CoE on 19-11-2012. 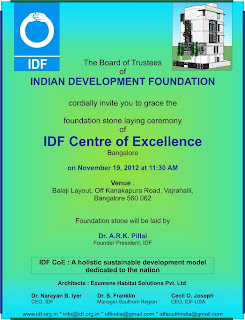 IDF solicits support from various corners for building the centre and dedicating it to the nation. Vivek Jain, IDF social ambassador presenting a sewing machine for IDF women empowerment project. 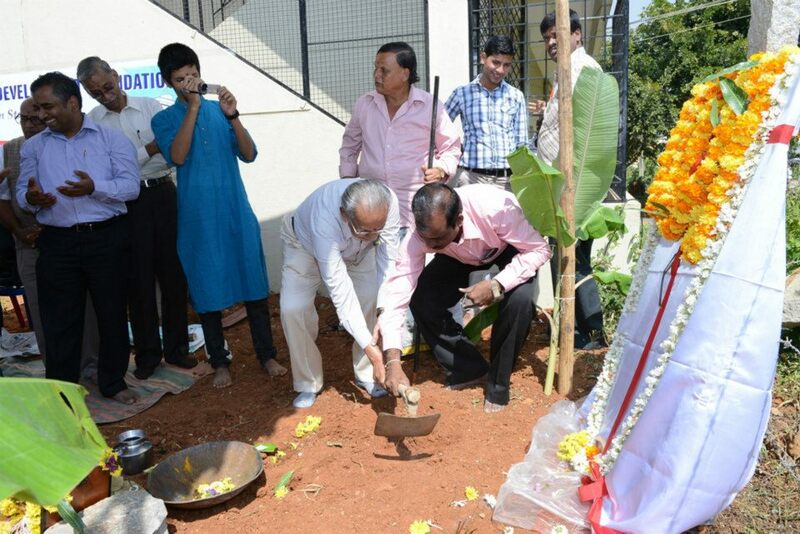 Sudhagad Education Secondary School, Chindran village, Panvel, Maharashtra. 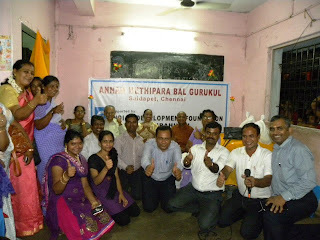 IDF runs Tilak Bal Gurukul at SES School from August 2009. Earlier status in Chindran school. • 320 children -- 60% girls. • No potable water/ no sanitation facility/ no electricity. • About 100 children walk 7+7 kms. from home-school-home everyday. 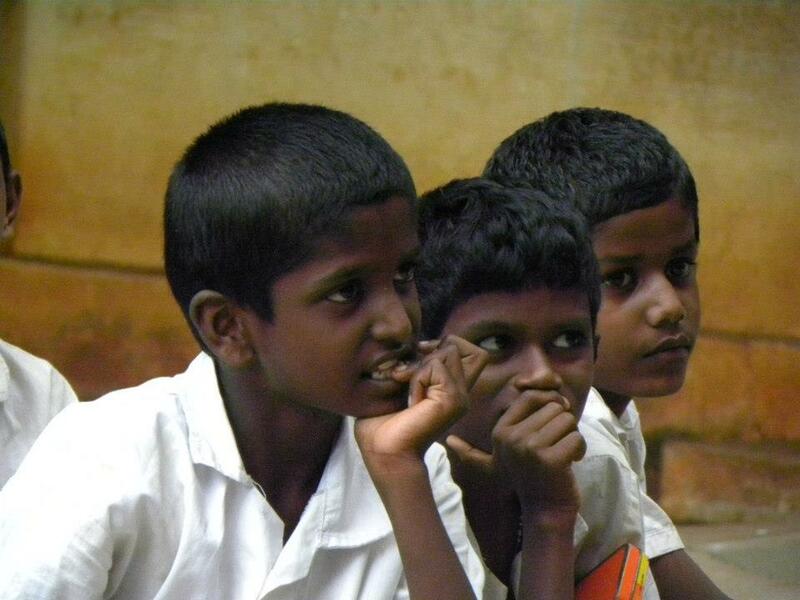 It is too burdensome for these small children, but do they have an alternative? • Pipe lines were laid and tanks fitted - Water Filter arrangement done. 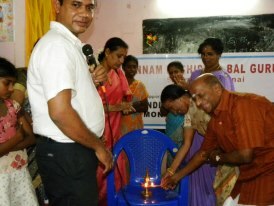 • 6 Toilets- 4 for girls and 2 for boys were constructed and commissioned. 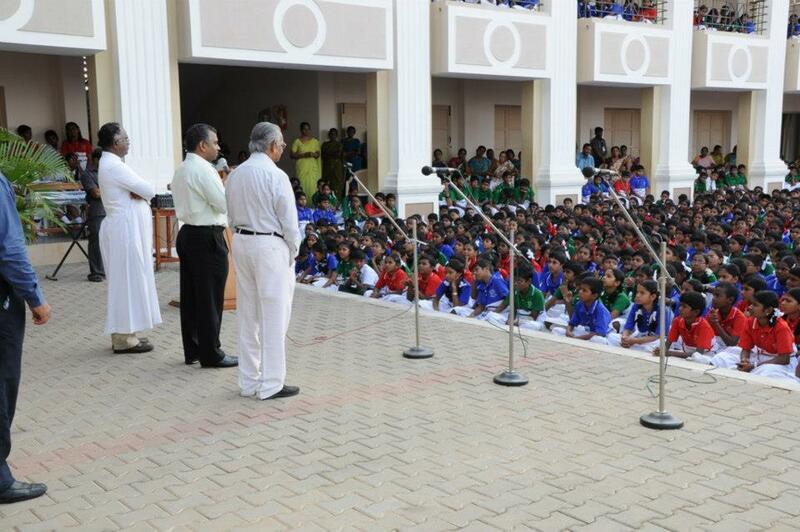 • Distribution of 50 bicycles to the needy and poor children. Our special thanks to all the Samaritans who supported Project Miles of Smiles. Grateful Thanks to Capt. Bala for making this project possible. 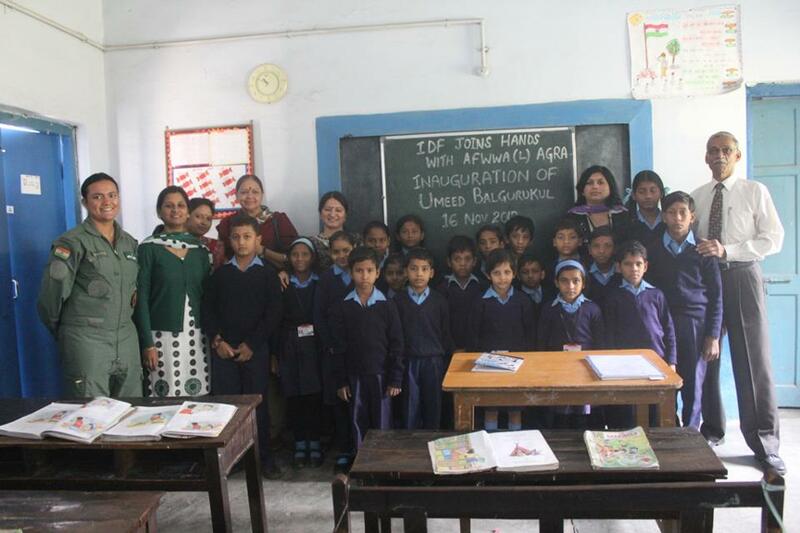 IDF joined hands with Air Force Women's Welfare Association (L), Air Force Station, Agra to start Umeed Bal Gurukul and help the students in Umeed Vidya Kiran School at AFS, Agra. Wg. Cdr. 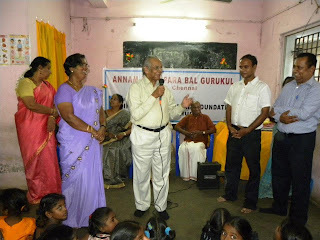 S. Balasubramanian (IAF Retd), VrC and Mrs. Shyamala Balasubramanian inaugurated the Bal Gurukul on 16-11-2012. Mrs. Anju Kapoor, President of AFWWA (L), AFS Agra, Mrs. Soma Nath, Vice Principal of Umeed Vidya Kiran School and Fg.Offr Sunena Malik, Hony. Jt. Secretary, AFWWA (L) welcomed IDF team and appreciated the gift of Bal Gurukul during festive occasion. IDF team congratulated AFWWA (L) team and also wished all the students success in their studies. IDF is committed to spread smiles on many lives. 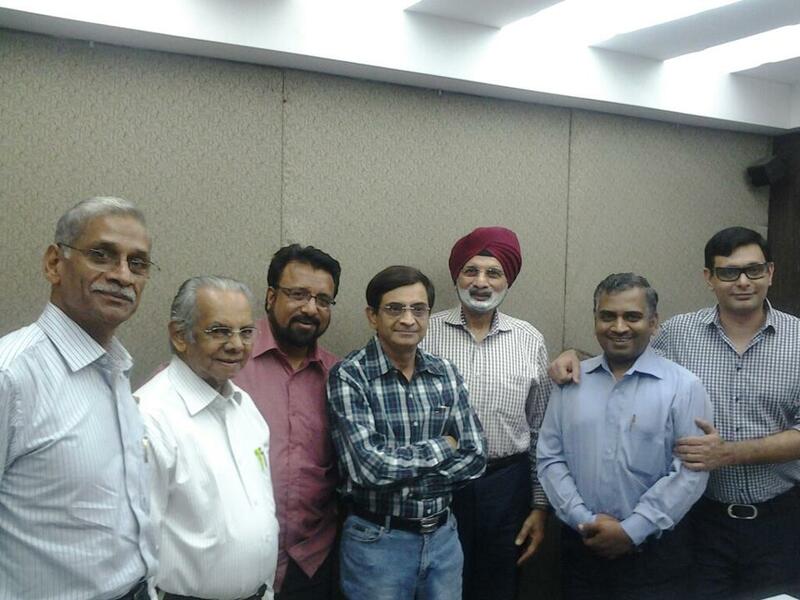 Indian Development Foundation organised a citizens' reach-out programme on the occasion of Diwali at Vimala Dermatological Centre, Versova, Mumbai on 09-11-2012. 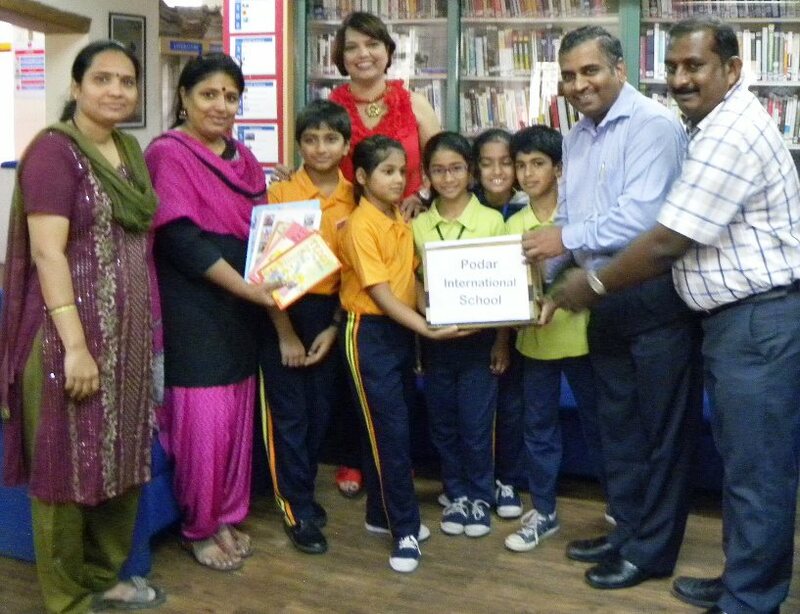 The event was organized in collaboration with Rotary Club of Mumbai North End. Prof. K. Chandana, Principal of Rizvi College of Education was the Chief Guest of the event who congratulated the efforts of IDF and Rotary Club in organizing such a meaningful event. Rtn. Aunali Rupani, Rtn. 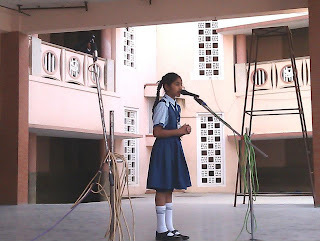 Sana Rupani, Rtn. Sanjay Bansal, Rtn. Sridhar, Mr. Rajiv Phadke, Mr. Cecil O. Joseph, Mrs. Neeta Sanghavi, Dr. Geetha Mohan, Mr.&. 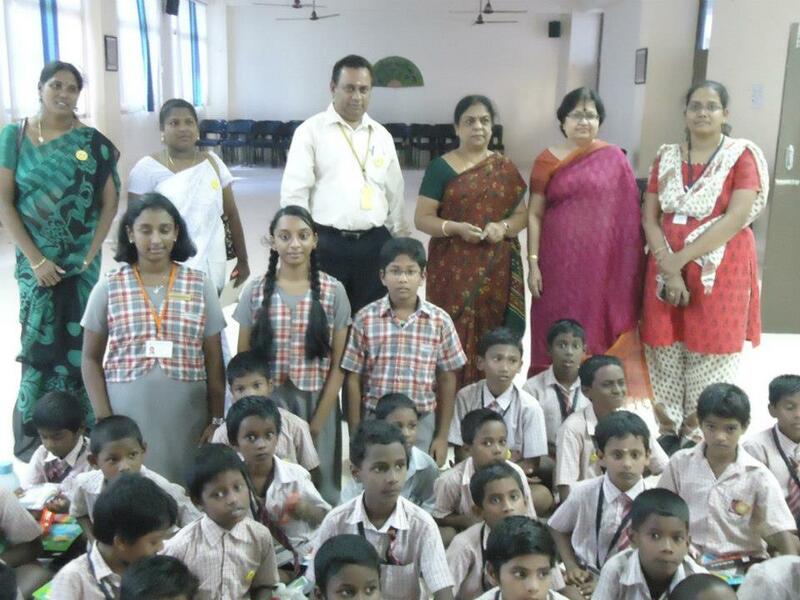 Mrs. Gada, Ms. Annabella, Sr. Sisily and Mrs. Rekha Bajaj joined Dr. ARK Pillai, Dr. Narayan Iyer and IDF team in wishing the inmates of the Centre and children a Happy Diwali. Volunteers from WAH, Vivek College of Commerce and UPG College of Management helped in organizing the gala event which brought smiles on many lives. Indian Development Foundation (SMK) in collaboration with SMK organised a Health Camp for the students of Bright Future Senior Secondary School, Nirman Nagar, Jaipur on 7th, 8th and 9th November 2012. General check-up, Eye care and Dental check-ups were conducted by the medical team. Shri Y. K. Sharma, Principal of the school appreciated the wonderful work of IDF and SMK and thanked the medical team for organising the medical camp. 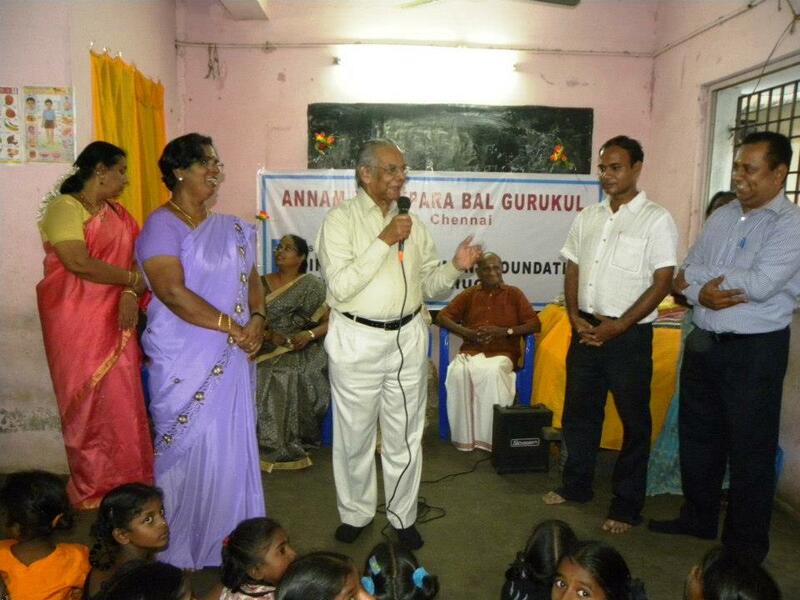 IDF launched Annam Methipara Bal Gurukul at Saidapet, Chennai on 08-11-2012. 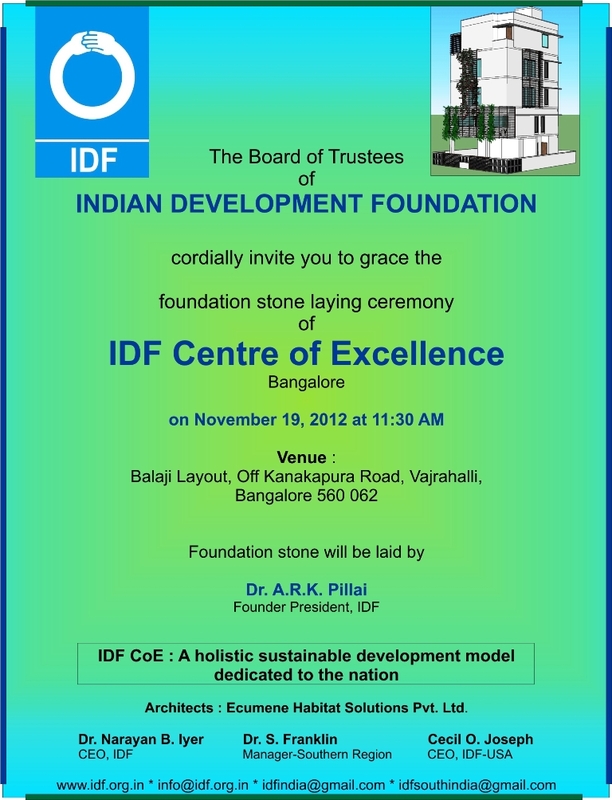 This is the 101st Bal Gurukul of Indian Development Foundation (IDF). 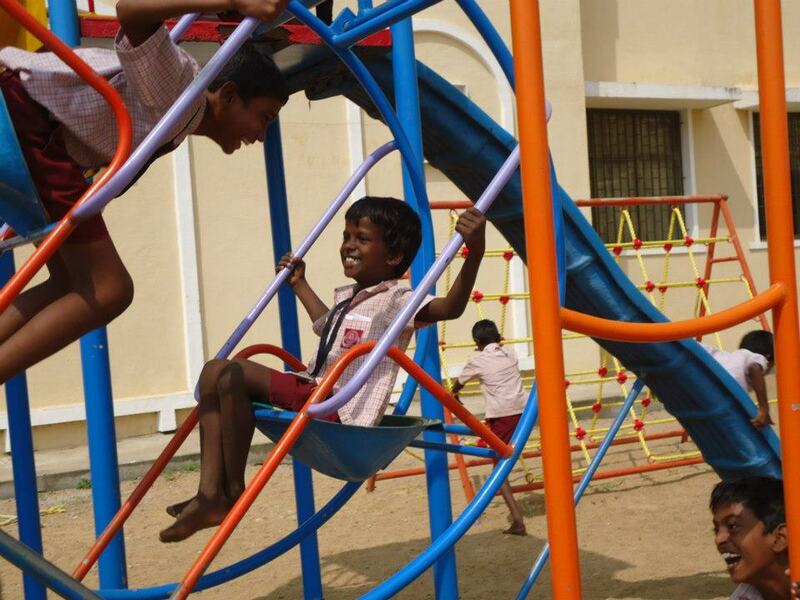 Annam Methipara Bal Gurukul will benefit the children in Dhobi Colony and resettlement families of Saidapet area in Chennai. 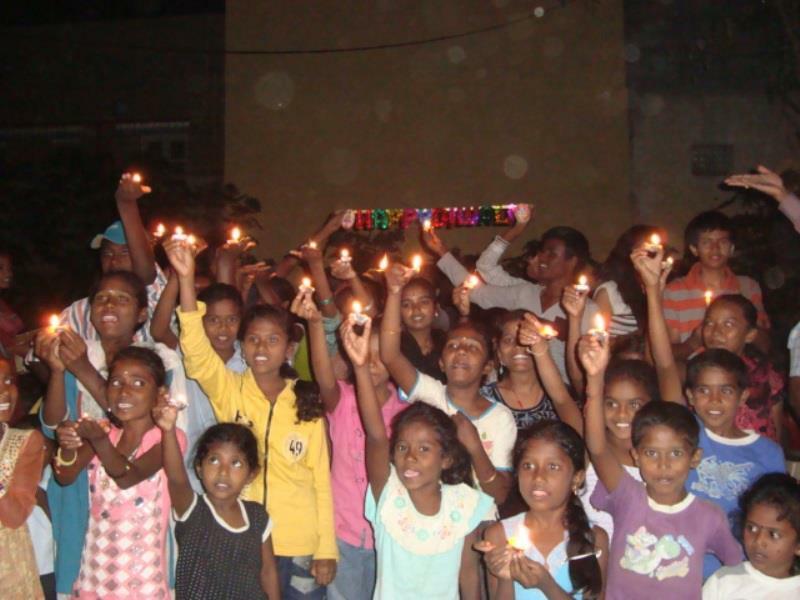 The Bal Gurukul is run in collaboration with Montfort Sirahugal (an organisation working for child welfare in urban slums). Special thanks to Mr.Tomi Methipara for supporting Annam Methipara Bal Gurukul. IDF is committed to bring smiles on million lives. IDF salutes the Montfort Schoolteam for extending excellent support to humanitarian programmes of the Foundation. 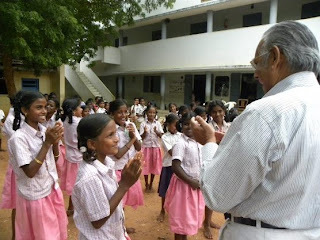 IDF team visited the school at Trichy on 07-11-12 to express gratitude and sincere thanks. Rev. Bro. 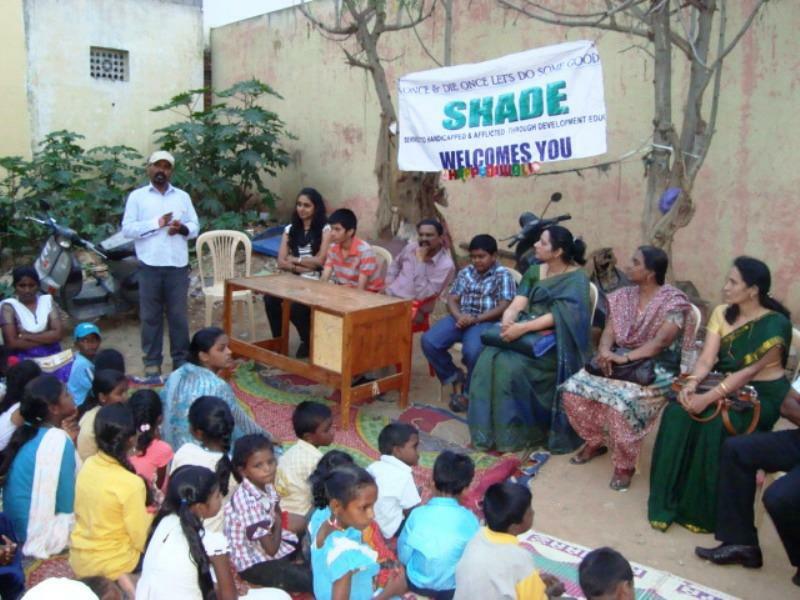 Dhanaraj, Principal of the School appreicated the national work of IDF. 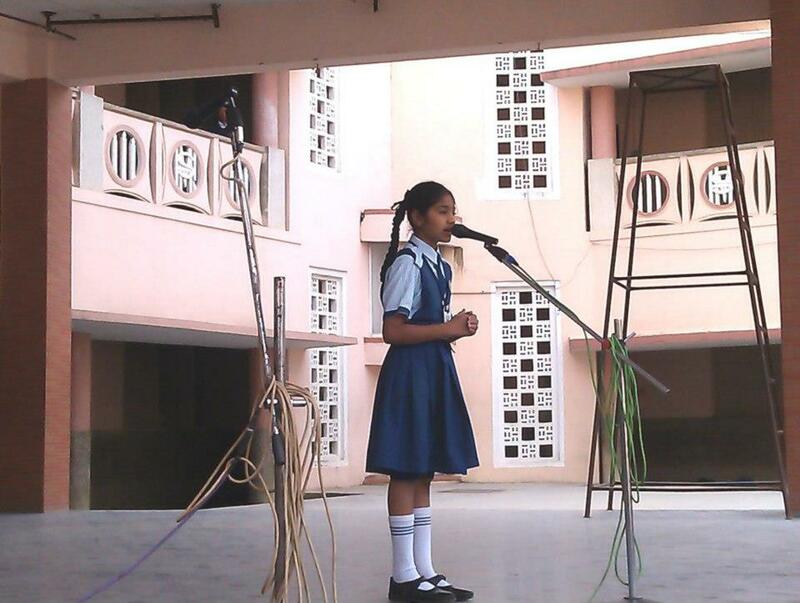 Aishwarya Srinivas, student of Montfort School, Trichy, Tamil Nadu and IDF Social Ambassador speaks on dreams in life. IDF appreciates the social concern of young minds in shaping a new nation of our dreams. 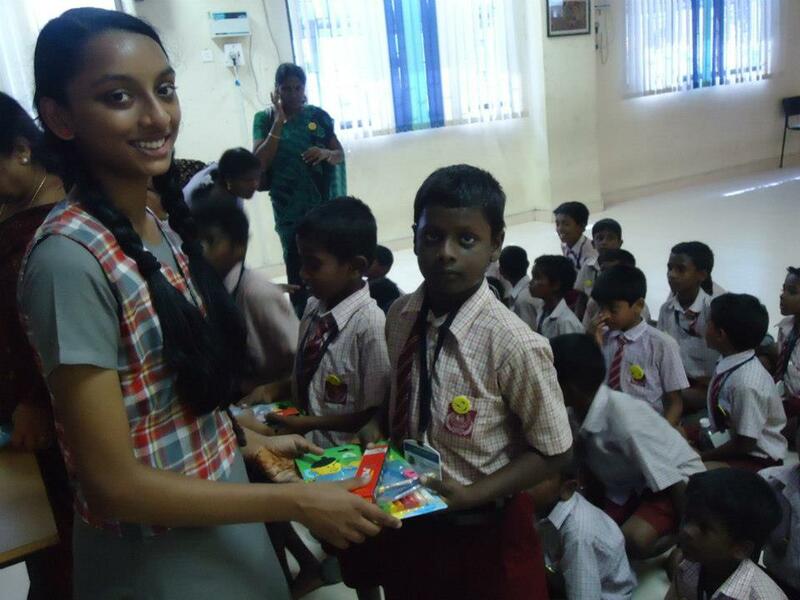 Aarthiha Srinithi, student of Montfort School, Trichy, Tamil Nadu and IDF Social Ambassador speaks on selfless service. 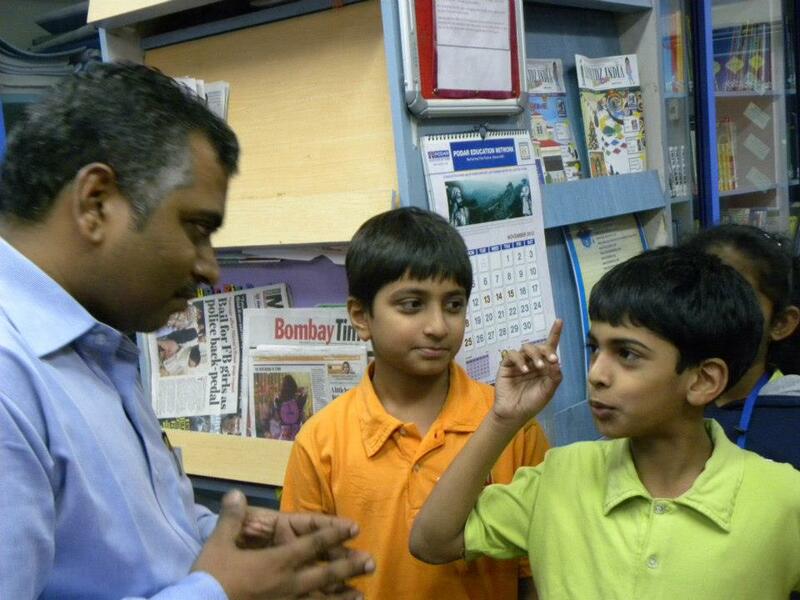 IDF appreciates the social concern of young minds in shaping a new nation of our dreams. 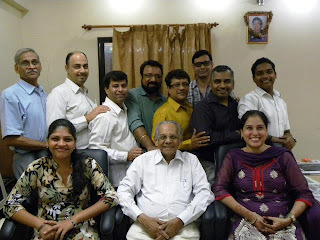 IDF team met on 3rd Nov. 2012 to share the journey of Project Goodness at the USA. IDF team met Dr. Hitesh Sanghvi , Chairman, All India Hotel Industry Committee to discuss on the development projects and proposal for IDF Centre of Excellence in Gujarat state. IDF young social ambassador Ms.P. Manaswi (Class VII from St. Anthony's High School , Himayatnagar, Hyderabad) addressing the students of Holy Mary Girls High School, Saifabad, Hyderabad. 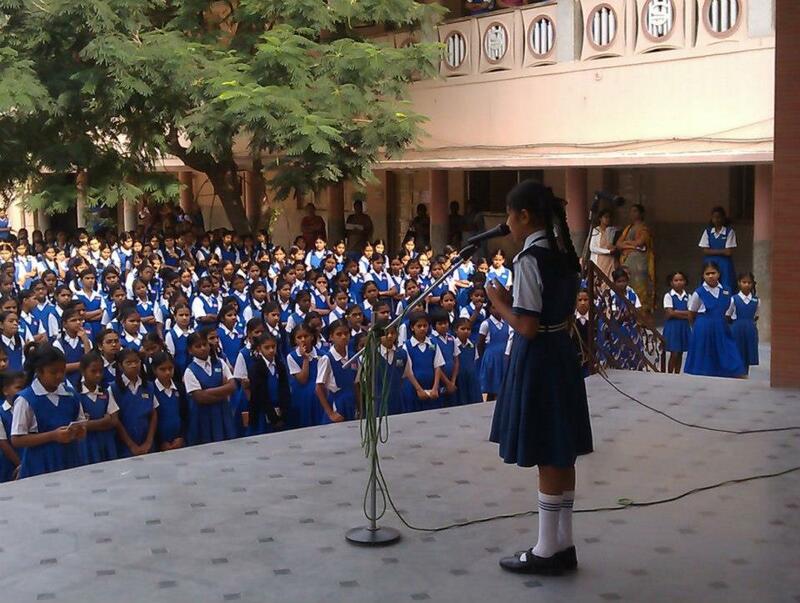 Students from class V to X received the message on TB awareness. IDF reaches millions through IDF social ambassadors. IDF salutes the young social soldiers. Jai ho !! !